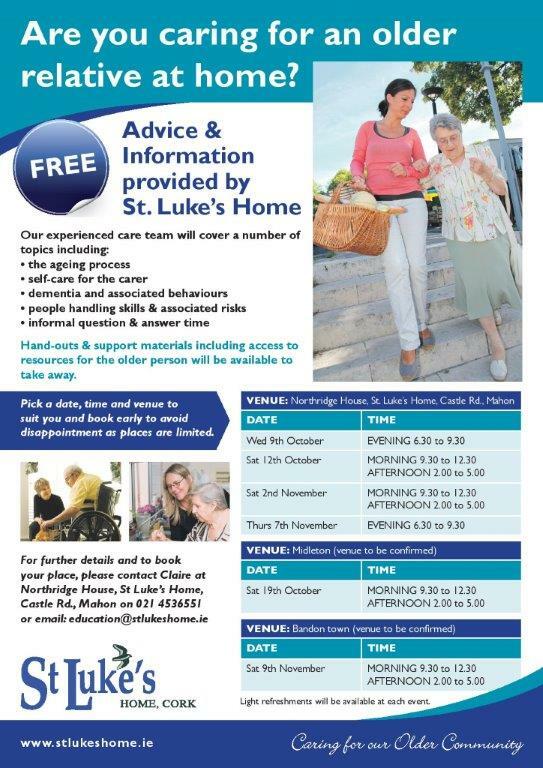 Saint Luke’s Home is a care facility for the elderly – a charity operated since the 1870s by the Church of Ireland and the Protestant churches in Cork – announces its forthcoming advice and training sessions for people who are caring for older relatives at home. It is a free-of-charge service to the local community that draws on St Luke’s over 130 years as a leading provider of residential care and support services to older people in the Cork region. As well as residential care, specialised dementia and alzheimer’s care the charity provides day care, and also runs its education and training centre at Northridge House. This entry was posted in Charities in the Diocese, Church in Society, Community Involvement, Contemporary Issues, Cork, Pastoral. Bookmark the permalink.